Paul Weller And Souad Massi Collaboration! LONDON, Feb 26 (Reuters Life!) 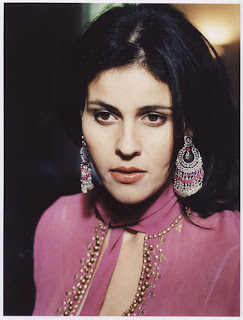 - Algerian singer and guitarist Souad Massi has won critical acclaim for her extraordinary voice and her songs that tell of love, exile and nostalgia, blending influences from American-style folk, Flamenco and pop with the classical Arabo-Andalusian music of North Africa. Massi, 35, grew up in the working-class Bab El Oued neighbourhood of Algiers and took up singing and playing the guitar at an early age. But the civil war in Algeria in the 1990s and the targeting of musicians and artists during the Islamist insurrection threatened to stop her fledgling musical career in its tracks. In 1999, she was invited to perform at a small festival for Algerian women in Paris, which led to a record deal. Massi left Algeria and now lives in France with her husband and small daughter, where she enjoys huge success. She spoke to Reuters after playing a special acoustic set at a film festival for women directors from North Africa and the Middle East in London. Q: You come across as someone who is very friendly and open, who smiles and laughs a lot - but there is a lot of sadness in your songs. A: Yes, but the majority of people who are sad - it's not that they hide behind a smile or a laugh - one isn't always sad. When we're sad, this marks us. I'm a singer and I sing it. A painter would paint it. Sometimes I worry that people think it's an act - but it's true that I adore talking to people. Sometimes I find that when I go into a shop or I'm on a train, people in Europe have lost the habit of talking to people they don't know. Q: Do you think this is a trait from Bab El Oued? A: Yes, this is something from where I come from. Now I go back and I don't know anyone, but children, adults, everyone says hello, good evening to you. You might even meet someone and they say: I have a headache, do you have any pills? Q: When you write your songs, what inspires you? A: It depends. For example, there are plenty of songs on the first album [Raoui - 2001] where there were very intense, difficult moments. That's when you write, when you get the idea and then develop it. For example, "Le Bien et le Mal" ("Good and Evil") was a song that I wrote after I saw the floods in Algeria. I was sad, sad because I said to myself - we've had a civil war, problems, an economic crisis - I was under the impression that we were a cursed people. This hurt me a lot. Q: What do you think about always being labelled a world music artist? A: Now it makes me smile...At the beginning I thought that they just couldn't be bothered to make the distinction: She's Arab - she makes world music. Senegalese, Russian - it's all world music. As long as you're not English or French, what you do is world music. That's why I say it's a racism problem. Q: But you say that now it makes you smile? A: Yes, because I have some distance now - I have nothing to prove. And there are some virtuosos, real virtuosos that are (classed as) world music - it doesn't matter. Q: Yesterday you were in the studio with Paul Weller. How is it to collaborate with him? A: He is someone very spontaneous and I like that. He told me he discovered my albums and he said he adored one of my songs - "Ghir Enta" ("I only love you") - and he made a version of it, which is magnificent...It made me happy to meet a legend like him who is so nice, who has such a drive to make music. Yesterday, we worked until three in the morning. We were tired but he didn't want to leave the studio. He had an idea and he wanted to follow it to the end. Q: Are you going to play with (Blur singer/songwriter) Damon Albarn again? A: He invited me to a workshop he did called Africa Express in December 2006, and we're going to do it again in March (March 6 at the Liverpool Olympia). I like these workshops because there is a stage, and there are instruments and you play and sing when you feel like it. He invites you and you do as you please. It's good because Albarn has a certain global status and he does things for Arabic and African music - it's a great undertaking by him. Q: Your songs explore themes such as love and immigration. What will you write about next? A: Yesterday with Paul Weller - it was crazy because there are things that are very private that one daren't say to those who are closest to you. You may be in a taxi or at the hairdressers and everything spills out. I never understood how that happens. Paul Weller is great and he said to me, so what are you going to talk about now? I've been touring for seven years. I've given many concerts, I've travelled a lot, I have a young daughter, and for the first time in my life I am on a break. I went to Algeria...I took a break to understand what is happening to me, to analyse my work, to correct my errors, to learn, to re-learn how to live because you lose yourself a bit when you travel. When you give, afterwards you have nothing left. Q: So what did you write about? A: When I saw Paul I said to him I would like speak about a good friend of mine who I respect and love very much who is living an enormous injustice and at the same time speak about what is happening in the world through her, to find metaphors, find unspoken things. I wrote about that - but I thought I wouldn't be able to write. He just gave me a piece of paper and said "Go!" I said: "Now? But I need time." He told me to go then, and I wrote the song. It did me good, because I think about it a lot. It's called "Laisse-moi en paix" - "Leave me in peace". I don't really listen to that kind of music but since PW said it was great I had a listen and it is quite a lovely tune even though I don't understand a word. Without a doubt, I'm certainly curious what his take on it will be. With stuff like this, the excitement for 22 Dreams just grows more and more for me. Paul Weller Tour Advert From NME! Paul Weller Page From MOJO's March Issue! Some UK Gigs Have Been Announced!